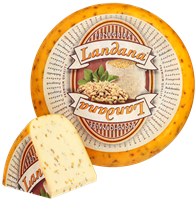 Landana with fenugreek now also in a delicious Dutch cow's milk version! Fenugreek is an annual herb with delicate pods packed with light-brown seeds. The fenugreek seeds have a magnificent, nutty flavor. This Landana cheese with fenugreek is uniquely delicious!